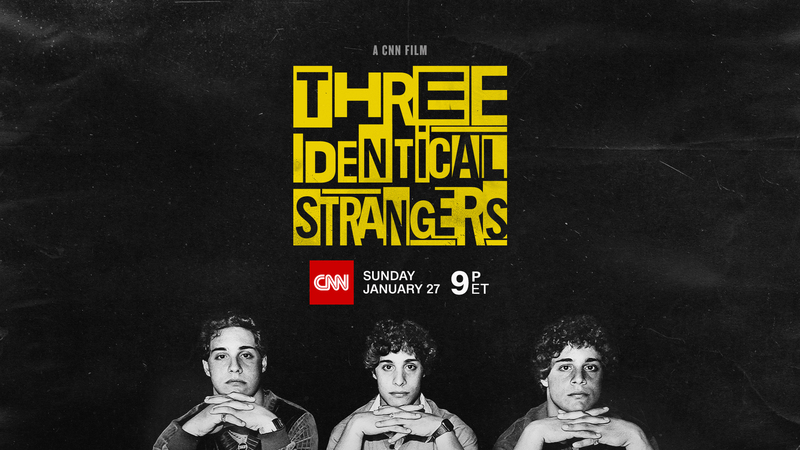 The CNN Films broadcast premiere of THREE IDENTICAL STRANGERS, the astounding true story of triplets separated at birth, reunited through coincidence as adults, only to later learn a dark secret behind their separation, will air TONIGHT Sunday, Jan. 27, in back-to-back, two-hour broadcasts at 9:00pm and 11:00pm Eastern (6:00pm and 8:00pm Pacific). The film will be presented on CNN with limited commercial interruption. Social media users can connect with others commenting on the film during the broadcast by using the hashtag #ThreeIdenticalStrangers. As a companion to the broadcast premiere, viewers can explore more about the issues raised in THREE IDENTICAL STRANGERS by accessing the companion podcast series: THREE IDENTICAL STRANGERS: The Science Behind the Story with Dr. Sanjay Gupta. Dr. Gupta, CNN’s chief medical correspondent and a practicing neurosurgeon, dissects a debate among many psychologists: whether people are shaped primarily by genetic or environmental factors and speaks with other experts about the Twin Study examined in the film. Special guests include THREE IDENTICAL STRANGERS filmmakers Tim Wardle and Becky Read; Dr. Nancy Segal, psychology professor and director of the Twins Studies Center at California State University at Fullerton; Dr. Barron Lerner, director of the bioethics curriculum at NYU Langone Health; journalist and author, Lawrence Wright (author of Twins: And What They Tell US About Who We Are, 1997); retired astronauts and twin brothers Cpt. Mark Kelly, USN (ret.) and Cpt. Scott Kelly (ret. ); and CNN anchors, and parents of twins, Alisyn Camerota and John Berman. THREE IDENTICAL STRANGERS will encore on CNN Saturday, Feb. 2 at 9:00pm and again, Sunday, Feb. 3 at 12:00am Eastern (Saturday, Feb. 2 at 6:00pm and 9:00pm Pacific).